The Ha'penny bridge was build in 1816, by William Walsh. It crossed the River Liffey and was the only pedestrian bridge on the Liffey until 2000 when the Millennium Bridge was opened. It got its name because you had to pay a ha'penny toll. It is one of the most loved and cherished sites of Dublin city. This Ha'penny Bridge keepsake, captures it's beauty and majesty and is wonderful piece of old Dublin to cherish. 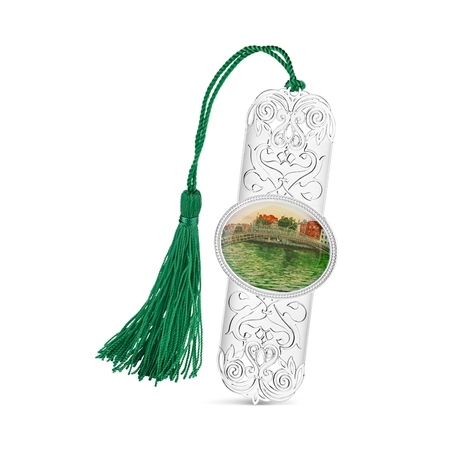 Silver plated Hapenny Bridge bookmark with a protective anti tarnish layer, suspended on a green tassel, presented in the Newbridge Silverware gift box. Product dimensions 110mm x 45mm x 2mm.